Having a positive body image can be difficult, especially when you’re a woman, a mom, when you grew up as the husky one in your group of friends, when … let’s just say it’s difficult, period. Can you tell I speak from experience? I know that many other women can relate. Growing up was difficult largely due to my body image. I grew up feeling, knowing and describing myself as fat. The adolescent body image I had of myself haunted me for years, and in a sense was like baggage I carried everywhere. It damaged me in addition to many relationships, including the one with my mother. I’m in a much better place now as I uphold a positive body image, but it has taken years, practice and reinforcement — also known as support and patience from my husband. A major shift in how I saw myself happened when I became a mother. Having children helped me establish the importance of having a positive body image. I’m not saying that becoming a mother magically made me like the way I look, but it did inspire me to continue working at loving the skin I’m in. I remember how hard it was not to like myself, and having my own children motivated me to do my best to help them avoid that phase in their life. I’m not naive enough to think that I can prevent the physical insecurity in my children entirely, but I do think that if I practice a healthy body image in front of my children, I can equip them with valuable tools to help themselves during the uncertain phase that we all go through (that’s right, we’re never alone). 1. Being conscious of how I talk about myself. I do my best to use kind words to describe how I look and feel. I try to avoid negative adjectives like fat or ugly, as well as shallow ones like pretty or cute. Instead, I work hard — and it takes practice — to use thought out words to describe myself. 2. Being conscious about how I treat myself in front of the mirror. When standing in front of a mirror, I do my best to avoid actions that cause me to grimace. For example, I will no longer pinch my belly skin and call it my muffin top. Instead, I try to focus on learning how to love myself the way my children love me. My son enjoys caressing my belly as he tells me how soft and cuddly it is. I appreciate his innocence because it not only reminds me that I’m beautifully made, but it also serves as an example to my son that the way I look is only one variation of normal. 3. If I have nothing nice to say, I won’t say it. You might remember this from elementary school. The concept that we learned as children still applies perfectly to life as an adult. If I think of something negative when looking at someone else, I will make a conscious effort not to say it aloud, especially if my children are with me. 4. I exercise because it is fun. The thought of exercising sounds boring to me, but when I put it in terms of dancing, hiking, exploring outside, I feel inspired. This has worked in my favor, teaching me that exercise is important because it is fun and it helps keep me healthy. I don’t exercise because I need to lose weight, and this is teaching my children to naturally like it, too. 5. I hug myself and tell myself “I love you” aloud. This is a part of my daily ritual. My children will not learn how to love themselves unless I teach them how. It is important for us — specifically my fellow moms — to know that having a positive body image isn’t something we are born with, or that happens overnight. We live in a time where we are constantly confused with what we should or could look like, and in some cases, shamed for what we do look like. May my words be a small reminder that we are beautiful in the skin we are in. This needs to be the norm. 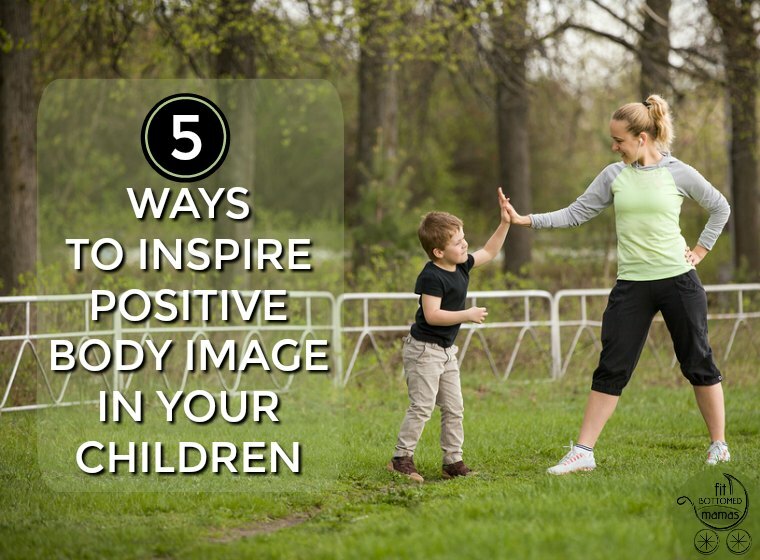 Wonderful ways to inspire positive body image in children. Having a positive body image means have a most of the time for us and it’s very important that every children looking itself as a best child, see himself accurately, feel comfortable in their body, and feel good about the way they look. At http://www.secureassignmenthelp.com/, one of my best friend who is providing assignment writing services with me and also worried about her kid who is feeling unsecured and behave like totally confused, so I would like to suggest this way to her and I hope it can be a helpful for her and she inspire her kid for healthy body image. Thanks. I am a regular reader of your blog. the blog is very interesting and will be much useful for us. i really enjoyed very much with this article here. Really its a amazing article that i had ever read. I hope it will help a lot for all the readers. Thank you so much for this amazing posts and please keep update like this excellent article.